Ramadan (Arabic: رمضان, Ramaḍān, Ramazan in Turkey) is an Islamic religious observance that takes place during the ninth month of the Islamic calendar, when the Qur'an was revealed. The name "Ramadan" is taken from the name of this month; the word itself derived from an Arabic word for intense heat, scorched ground, and shortness of rations. It is considered the most venerated and blessed month of the Islamic year. Prayers, sawm (fasting), charity, and self-accountability are especially stressed at this time; religious observances associated with Ramadan are kept throughout the month. Laylat al-Qadr, which falls during the last third, commemorates the revelation of the first verses of the Qur'an and is considered the most holy night of the year. Ramadan ends with the holiday Eid ul-Fitr, on which feasts are held. During the month following Ramadan, called Shawaal, Muslims are encouraged to fast for a further six days. Laylat al-Qadr (Arabic: لیلة القدر) (also known as Shab-e-Qadr in Farsi), literally the "Night of Decree or Night of Measures", is the anniversary of two very important dates in Islam that occurred in the month of Ramadan. Muslims believe that it was the night of the Laylat al-Qadr that the Quran's first verse was revealed. The exact night of the Laylat al-Qadr is unknown. The Prophet Muhammad indicated that it was one of the last ten odd nights of Ramadan. The Islamic holiday of Eid ul-Fitr (Arabic: عيد الفطر) marks the end of the fasting period of Ramadan and the first day of the following month, after another new moon has been sighted. 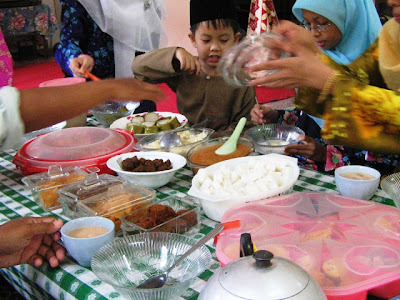 Eid ul-Fitr means the Festival of Breaking the Fast, a special celebration is made. Food is donated to the poor (‘Zakat al-Fitr’), everyone puts on their best, preferably new, clothes, and communal prayers are held in the early morning, followed by feasting and visiting relatives and friends. The prayer is two rakaahs only, and it is an optional prayer as opposed to the compulsory 5 daily prayers. And this year it falls on 12th of October, as a sign of respect to fellow Filipino Muslims it is declared as a Holiday. Yup, you heard me right, lately this year we’re having lots and lots of holidays and it’s an advantage for some, but for a university? It’s a hassle and another problem, because we have already settled the whole calendar activity for the semester but because of reasonable things we have to move activities that is been affected by the said Holiday. So that means, I’ll be at home the whole time tomorrow. The "no work" holiday is an advantage for me. It means more time to blog. He, he. . .